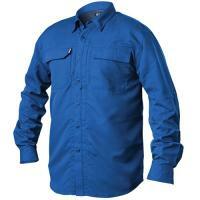 The Men's Tac Convertible Shirt from Blackhawk! is a tough and durable tactical top that is ready for action. Constructed from lightweight, high-density ripstop fabric, the shirt has the strength to handle rough days in the field and in the office. Front chest pockets offer ample item storage as well as a sleek professional look. Designed with the needs of tactical professionals in mind, the shirt features a breakaway placket that allows wearers to quickly access concealed weapons. The vented back panel is perfect for active lifestyles and offers added breathability on warm days. A Teflon® Shield repels water, grease and stains so users are guaranteed to look fresh all-day long.